Speaking to both ends of the chain, Internet-based distribution systems checks the content was sent and received. 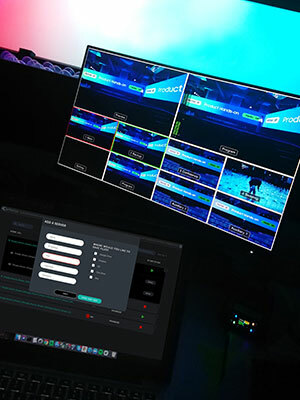 It can detect if your playout or source fails and within milliseconds it knows if your content encountered issues in transit, which means you can implement the protocols to rectify any issues quickly. In contrast, satellite providers are keen to prove they’ve sent your content, but have no way of knowing if your affiliate received it, or successfully decoded it. And while fibre providers can promise you 99.99999% reliability, harsh as it sounds, they don’t actually care about whether your content gets there - it’s just about providing the distribution mechanism. Internet-based distribution gives you more control and more functions ‘built in’. Furthermore, when you add backup into the equation, it becomes even more compelling. Unlike some providers, we build in the redundancy and actually test the failover to ensure that if your primary distribution failed, the backup delivery path would work – because the last thing you want is to be responsible for a failure such as a blackout during the live broadcast of a major show or event. If you’ve chosen a managed service provider to assist you with playout, generally you’ve tied yourself into a long term contract. Then when it comes to distribution, generally speaking people have a mix of both satellite and fibre. This means you probably have a three-year contract with your satellite provider, and then various contracts and service level agreements (SLAs) for your fibre provision. Your first problem is trying to overcome the sheer complexity of the situation and make sense of it all, so you don’t oversubscribe to any particular service. Your second problem is the shortfall; if, like many organisations, you find your distribution contract finishing before your playout contract, you could face months without any cover – what do you do? Figuring out how to extract yourself from the situation is just overwhelming…but it doesn’t have to be. With Internet-based distribution, the details of your playout provider is less critical. The Internet doesn’t care where your playout is based; with data centres around the world it’s easy enough to switch where your content is hosted if/when you switch playout providers – it’s just a case of ‘moving the box’. And the Internet doesn’t care about the term of your playout contract. Our clients typically sign up for a year, and we can offer flexible packages to help give you the coverage you need while aligning with your playout contract running its course. And it’s not even that difficult to set up; with fibre it can take three-to-six months of contract negotiation and set up to get everything in place. With Internet it’s a lot faster - our current record is 37 minutes, when we were tasked with getting the 6 Nations Rugby tournament to a global audience. Internet-based distribution gives you flexibility so you never have to feel trapped again. Sure, Internet-based distribution sounds great with its flexibility, cost-effectiveness, and ability to get up-and-running quickly - but what about the infrastructure you’ve invested so heavily in? Surely you can’t just throw that all away? As much as the promise of Internet-based distribution sounds great, the reality is that with legacy infrastructure so ingrained in many organisations, people just aren’t invested, understand or committed to seeking out another way. The expectation used to be that you would extract value from your infrastructure for 10-15 years. Today’s reality is that it’s just three years. So perhaps that infrastructure isn’t as ingrained as you first thought. Also, for new requirements or to test the viability of a new channel or revenue stream why do what you always did when the business case often failed to fly due to set up time and long term commitments but IP distribution gives you a solution without the need for whole sale organisational change. When considering any updates to your infrastructure it can seem a daunting and time-consuming task. But it doesn’t have to be. Just start with something simple. If you haven’t already done so, consider splitting your playout and primary content distribution providers. Trust us. Playout is a specialist, complex area, and unless you have the skills in-house, you’ll absolutely need an expert to help you. BUT…primary distribution, especially Internet-based distribution, is a specialist field too, which requires a different expertise that goes with it. So why would you hire an expert for one and not the other? On the 26-28 February Cerberus is exhibiting at BVE. Join us on stand B36 to discuss anything and everything to do with Internet-based distribution so you have the information you need to make that sensible choice.